Hip length pieptar edged with fur and decorated with brown, and blue embroidery, with a few woollen tassels attached in rows on edge of embroidery. 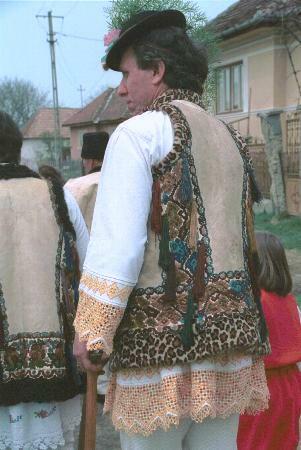 Hip length cămasă dreaptã with gussets, decorated with yellow crotched lace. Small black felt hat. Photo taken in Monor, Bistrița-Năsăud county, May 1996.